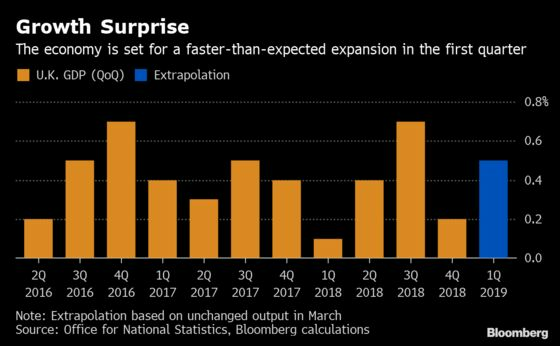 The U.K. economy is on course for a stronger-than-forecast first quarter despite an escalating Brexit crisis that’s divided Parliament and the government. Gross domestic product rose 0.2 percent in February after a 0.5 percent jump in January. That means the economy will expand 0.5 percent in the first quarter if GDP is unchanged in March. That’s more than double the pace of the previous three months and faster than the Bank of England expects. Some of the pickup in growth may be due to Brexit stockpiling, with the statistics office reporting anecdotal evidence of companies bringing forward orders before the original March 29 deadline to leave the European Union. The U.K.’s departure now looks set to be delayed by as long as a year as leaders meet in Brussels Wednesday. The data may provide some small cheer for embattled Prime Minister Theresa May as she awaits a final decision on the length of the delay to Brexit. European Council President Donald Tusk has rejected her request for a brief postponement and a longer period risks a backlash that could further destabilize the U.K., both politically and economically. The pickup in February was broad based, with manufacturing rising 0.9 percent and construction gaining 0.4 percent. The poorest performer was the dominant services industry, where output rose just 0.1 percent. 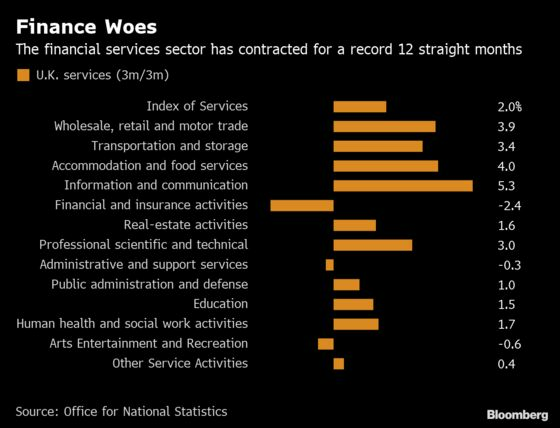 Financial services and insurance firms cut output for a 12th consecutive month, the longest run since records began in 1997. The strength of February left GDP 2 percent higher than a year earlier, the fastest annual growth rate since the end of 2017. But the first quarter will once again get no help from trade, with the deficit in goods and services set to widen against a backdrop of slowing global growth.